In this final chapter, Dr. Paris explains the causes of disengagement and moving through disengagement. You’ll recall that disengagement is what happens when we come to the end of creative immersion. It can be a positive or negative experience. Dr. Paris describes seven factors that cause disengagement: external interruptions, running out of energy, problems or stumbling blocks, emotionally threatening artistic content, waiting, feeling overexposed, and criticism. External interruptions are those breaks that result from demands of time on your schedule. This basically refers to those demands known as family, grocery shopping, laundry, caring for our parents, taking pets to the vet, parent-teacher conferences, and so on. You know, that thing called life that demands your time and that puts an artificial end to your immersive experience. These interruptions are frustrating. We’ve all experienced them. We’ve all complained about them. And one of the best ways to work with these interruptions is to set boundaries when possible, set a schedule when possible, and accept that life happens. Another factor that causes disengagement is simply running out of energy. While creative immersion is energizing, it can also be emotionally and physically tiring. How often have you found yourself working in a creative flurry, losing track of time, and eventually realizing that you haven’t eaten all day. Or maybe you’re functioning on just a few hours of sleep. When your physical and psychic energy runs out, disengagement is forced upon you. You.simply.must.stop. How can you keep from running out of energy? You can stop at a point in the day where you are clear about the next step and can reenter the immersive phase with anticipation rather than apprehension. Disengagement also happens when you run into a problem or hit a block in the artistic process. Have you experienced this? You’re working along, in the flow, and then you run into a problem. The once fluid relationship suddenly becomes frustrating. Maybe the problem causes you to feel inadequate or that you’ve lost control. This is a defensive engagement, according to Dr. Paris, because we fear that our underlying fears of inadequacy will be confirmed if we continue to struggle with the project. It is during this type of disengagement that alternative forms of support (relationships, spirituality, etc) are essential. Sometimes, disengagement happens when “the content of the artistic piece becomes too threatening.” That is, creating art may raise fears because the piece is an expression of deep emotions. When the artist fears becoming overtaken by his/her emotions, fears humiliation due to exposure, or needs to integrate this experience, the artist may need to disengage from the creative process. Often an artist emerges from this experience transformed, but the breakthrough can be disturbing and frightening. Waiting; waiting for feedback, waiting for an answer. Whatever we may be waiting for, it leaves us in a vulnerable state. When we’re waiting, support from others again is critical. It is essential not to withdraw from others during this form of disengagement. This form of disengagement results when creative types suddenly realize that they have “opened and revealed their core self to others” in their art. In this situation, you suddenly realize that you’ve let down your “self-protective shields.” And then we may panic because we feel helpless to protect ourselves from the audience. Our relationship with our audience and our past experiences with our audience will directly influence how we react in this situation. This final cause of disengagement is a biggie. Negative feedback and criticism can cause an immediate end to creative immersion. In an immersive experience, we feel connection to the artwork, we feel perfection. And then someone interrupts that connection with a negative comment and our “perfect union” with the art is shattered. We ask ourselves “Is what they said true?” “Is there something wrong with what I’ve done?” We may begin to doubt ourselves, lose trust in ourselves, and doubt our work. Though Dr. Paris did not address the handling of criticism, I’m sure she would stress, once again, the importance of having a support network during this time. When disengagement happens, we need to understand how we lost the connection with our artistic work. Here Dr. Paris refers back to the causes of disengagement described above and provides a detailed explanation of what an artist can do once we understand what caused the lost connection. As creative types, we understand that aloneness is a great barrier to creativity. Dr. Paris defines “aloneness” as “aloneness in one’s inner world; that world where we experience breaks or fractures in our sense of self.” As she has reiterated throughout this book, it is essential that creative types have support networks where we can share our experiences with others. This support can come from loved ones, close friends, peer groups, online communities, and therapy. There are two schools of thought on the “nature of the state of self.” One says that our experiences in childhood determine our strengths and weaknesses and that this is fixed and static. The other says a person’s self-state is determined by the current context of relationships. Either way, artists bring a certain set of fears and coping responses to every artistic endeavor. In a nutshell, experienced artists recognize and accept their individual tendencies and patterns. Recognizing and accepting these tendencies when it comes to immersion helps us accept times of disengagement. Final disengagement comes at the moment of artistic completion. Here the gratification of perfect expression, reflected in the artwork, is the artist’s barometer of success. Following the experience of gratification, we begin to disengage from the artwork. The final disengagement is what allows us to sell our artwork and move on to our next creation. 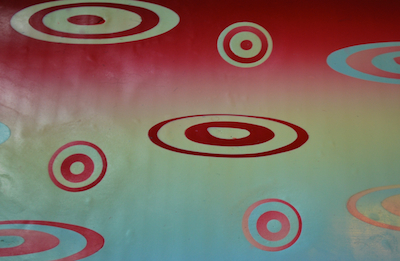 If we experience a good relationship with our artwork, disengaging from it when it is completed is often easier. However, if our relationship with the artwork was difficult, disengagement from the artwork may be painful or avoided completely. 2. Stop pressuring yourself to reengage. Understand the reason for disengagement first. At the end of the book, Dr. Paris includes an appendix of sentence prompts that focus on fantasies, self-perception, fears, and support structures. These prompts may be used to help creative types understand these areas on a deeper, more meaningful level. 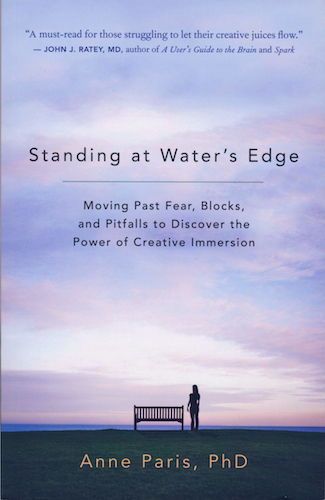 Categories: Balance, book review, Creativity, Inspiration, Networking, Opportunity, Self-confidence | Tags: Anne Paris, book review, Books, Creativity, dreams, emotions, fear, Inspiration, life, self, Standing at Water's Edge, success, Support | Permalink. 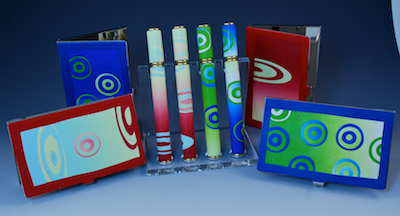 These new colors and patterns will also be available on my wine bottle stoppers. In other body-theme related activities, I did return to yoga class after being away from it for more than six months. We both stopped going to yoga due to injuries and finally felt ready to give it a try this week. Appropriately, we went to a restorative class with one of our long time teachers. The class was definitely good for the body and the mind. Hopefully we’ll return to some sort of regular schedule in the near future. And I visited a friend who is battling cancer. Several months ago a group of friends formed a helper’s schedule after her diagnosis and surgery. Different people visit on select days providing support and being of service. Being of service to a friend teaches me appreciation and gratitude. Categories: Amy's Art, Business, Creativity | Tags: art, Body, Business, CED 2010, Color, Creativity, Friendship, gratitude, health, Inspiration, Polymer clay, Yoga | Permalink. My goal with CED is to dedicate part of one day each week to an art activity inspired by the monthly theme. If I’m able to fit in other non-art related activities inspired by the monthly theme, even better! Monday: Started the week off nicely with a treat for the body-a hot stone massage. Wednesday: Exercised the body with a half day of skiing. Friday: Friday is the day I try to dedicate to an art specific project using the CED theme for inspiration. 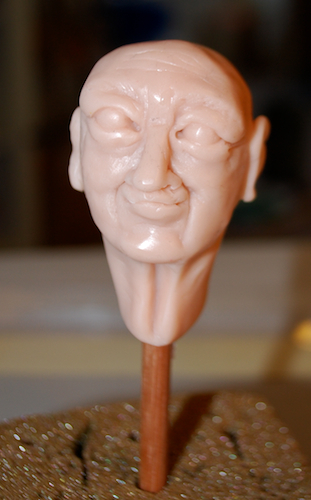 During the week I finished sculpting a head following the Creager’s head sculpting DVD. 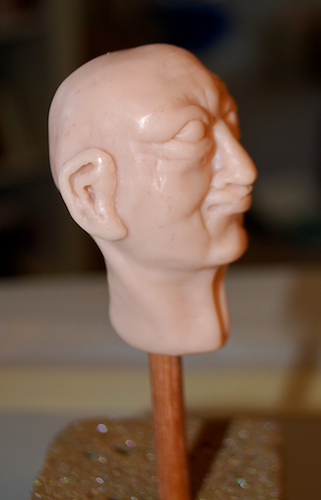 Heads always look a little scary before going in the oven and before the eyes are added. 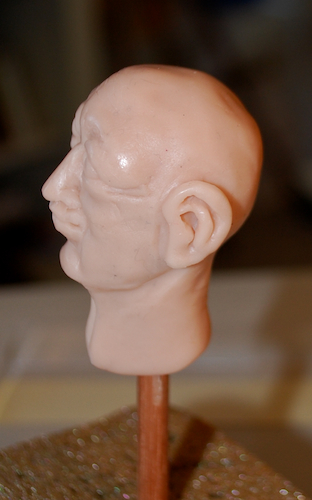 This head also shows my first attempt at sculpting ears. 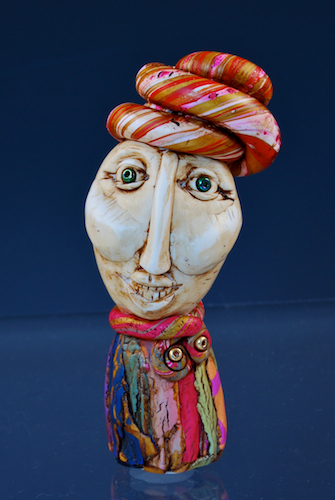 And I completed this little guy, “Man in Turban.” This piece will be sent to the sons of a gallery owner. The boys helped in the construction of the head. On this particular Friday I pulled out Cate Coulacos Prato’s book Mixed Media Self-Portraits and worked on a warm-up exercise called “Color Your World.” Through this exercise you create a self-portrait using one color. The portrait can be literal or abstract or expressive. Prior to creating my self-portrait, I meditated for a few minutes to get clear on which color was “me” this morning. I repeated the names of several colors over and over and the one that came to me most prominently was orange. Okay; I spent 15-20 minutes gathering materials including colored pencils, markers, oil pastels, paints, construction paper, and tore orange colored images from several magazines. Then I got to work. 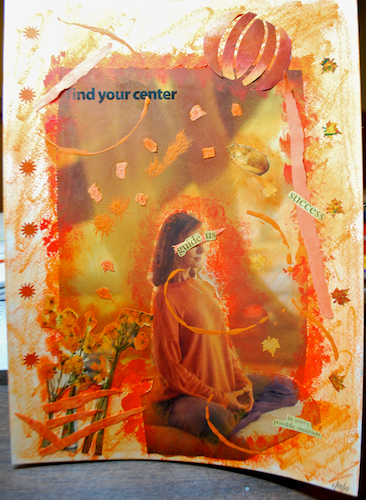 I started by scribbling in a background and then glued the large image with the words “Find Your Center” on the middle of the paper. The woman meditating was glued on top of this background. From here I worked intuitively, not really stopping to think about my choices. I just cut, scribbled, tore, and glued paper. Sometimes I would flip the image upside-down to see blank spaces that needed filling. During all the activity I remembered my paper punches and used them on the magazine images as well to make leaves and starbursts. The piece seems to have no rhyme or reason. I started with the woman mediating because I like to meditate though I don’t do it as often as I used to. Ironically she was wearing an orange top! 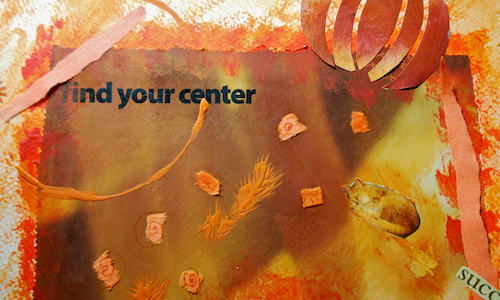 I also liked the words on the background image (Find Your Center) because I’m always working on learning more about my intuitive, spiritual side. As I finished this piece I applied a wash of orange watercolor and thinned orange acrylic paint. As the piece dried, I spontaneously added a small strip of orange construction paper over the woman’s eyes. For some reason I didn’t want to focus on her eyes. I added a couple more strips of construction paper on the upper left corner and the right side of the piece. 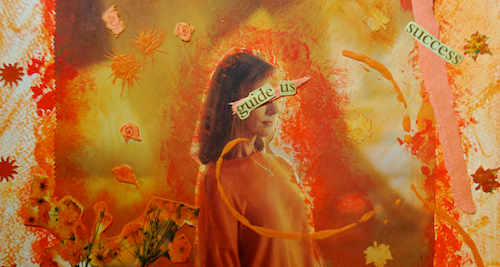 And then I glued the words “Guide Us” over the woman’s paper covered eyes. This represents my intuitive side, the part of me I’m trying to open up and learn about. Finally I addded the words “Success” and “In every possible situation” to complete the piece. So I guess what this piece tells me is that I’m trying to find my center to guide me to success in every possible situation. Orange is a blend of red and yellow. It symbolizes stimulation, success and attraction. Orange is associated with orange fruit which symbolizes fruitfulness and fecundity (capable of producing offspring or vegetation; fruitful; marked by intellectual productivity.) Orange is the color of the sacral chakra which is associated with nurturing, receptivity, and emotions. Orange is often used to depict the sun. It symbolizes happiness, socializing, abundance in career, projects, and matters needing an added push. Categories: Amy's Art, Chakras, Collage, Inspiration, Intuition, Mixed Media, Sculpture, Spirituality | Tags: art, Books, Cate Coulacos Prato, CED 2010, Creager's, Creativity, health, Inspiration, Intuition, Julie Stuart, massage, Mixed Media, sculpting, Spirituality | Permalink. In this stage, creative types feel that they have prepared enough and have no preparation at all. We are filled with hope, yet terrified. This immersive state might last a few minutes, a few days, or several weeks. Like any intimate relationship, our relationship with our art form ebbs and flows. Some days we experience an immediate connection with the art and jump right into the immersive experience. On other days it is like pulling teeth as immersion comes in bursts and fits. And like those relationships with people, our art can make us feel confident or insecure. The relationship we have with a particular piece of work can affect the quality of our immersive experience. I’m sure you’ve experienced that lack of connection with a piece; the one that just isn’t coming together, the one you have to walk away from for a period of time, or maybe you trash it outright. Our ideal immersive state is one of bliss, where we feel everything coming together and are fully engaged with our art. More often, however, we experience a “process of destruction-creation” where we must give up notions of control and independence in order to become intimate with the artwork. Interestingly children do not go through this process. They immerse in creativity and play more easily than adults because they haven’t experienced rejection and disappointment and have less need to control. Therefore we must remind ourselves to approach immersion with a sense of play. Dr. Paris ends this chapter with a brief mention of a special type of immersive state she refers to as “crafting.” Crafting is defined here as the rehearsals, rewrites, and revisions. In other words, the problem-solving process or refining of the creation. During this state we may experience our work as brilliant one moment and then completely worthless in the next moment. Dr. Paris offers one important guide at the end of this short chapter: PLAY! To play in the moment and to play with your chosen medium. Categories: art, book review, Creativity, Inspiration, Opportunity, Self-confidence | Tags: Anne Paris, art, book review, Books, creating, Creativity, emotions, fear, immersion, Inspiration, Standing at Water's Edge, success | Permalink. At the end of last year, I posted my thoughts on my word of the year for 2009. At that time I mentioned having a list of potential words for 2010 yet none had struck a chord with me. The words on this list included: momentum, motivate/motivation, clarity, listen, courage, abundance, leap, expand, faith, and presence. Over a few days I worked with Christine Kane’s Word of the Year Discovery Tool contemplating and answering the questions. I was drawn to the words momentum, faith, expand, and abundance yet none of them felt quite “right.” I thought more about the past year and what I felt was missing within me. What kept me from having a better year. Momentum was the first word that came to mind last month when I began to think about my word for 2010. But that word also scared me. What if I chose that word and all hell broke loose with stuff coming at me from all directions? Was that the kind of momentum I was seeking? What if life came at me faster than I could handle and I found myself in overwhelm? After answering a few questions in the Discovery Tool worksheet, I decided to sit quietly and meditate on this situation. Getting quiet and clear brought the word to me in an instant. That’s it! I want to SOAR in 2010. Now where did that word come from? In some ways it is an extension of momentum. I think the reason momentum didn’t quite work for me was the word brought to mind moving very fast and then hitting a wall or gaining speed only to poop out. Momentum is hard to maintain. Sometimes you go really fast but don’t have anything to show for it. Soar brought to mind the hawks I so admire; the hawks I often see soaring above the earth, moving gracefully on thermals. They show such strength, power, and freedom. And they look like they’re really enjoying themselves. Having the word soar to guide me through this year gives me confidence and the ability to face fear and move beyond it. I think it actually moves me beyond expansion and momentum. I look forward to seeing how this word will guide my year. So far it has brought me an accountability (goals) partner, a potential new consignment sales opportunity and the potential to have my artwork included in some soon-to-be-published books. 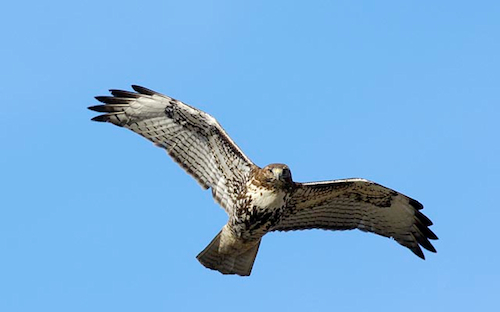 The word SOAR is written on my calendar along with this mantra: SOAR with Momentum into Abundance and have Faith. Categories: Creativity, Inspiration, intention, Nature, Opportunity, Spirituality | Tags: abundance, change, Christine Kane, confidence, dreams, faith, fear, hawks, Inspiration, intent, Nature, philosophy, red tail hawks, Spirituality, Word of the Year | Permalink. Categories: Inspiration, intention, Quotable Monday, Quotes, Spirituality | Tags: immerse, Inspiration, Intuition, life, Paul Coelho, Quotable Monday, Quotes, soul, Spirit, Spirituality, universe | Permalink. After a hiatus in 2009, I signed up for Leah Piken Kolidas’s Creative Every Day (CED) 2010 Challenge. If you’re not familiar with this challenge, go here to learn more. Each month, Leah provides a theme or prompt that we have the option to use as creative inspiration. The theme for the month of January is Body. I will do my best to post each week how I used the particular theme to inspire me in all matters creative. I started the month by celebrating Mother Earth and blue bodies on New Year’s Day and saw the movie AVATAR in IMAX 3-D. That was quite an experience. Next we celebrated food and friendship, always good for the body and soul, when we hosted our Day After New Year’s Day Open House. On Tuesday, it was time to take care of the body, my ears specifically, with a visit to the ENT. I’ve been dealing with tinnitus at varying levels for more than a year. While it appears that nothing can be done for the tinnitus, I did have a hearing test that showed my hearing to be nice and normal. Well, there goes the “honey I can’t hear you, speak louder” excuse. Thursday was a treat for the physical body when I got my hair cut. It always feels good to have someone else shampoo your hair and massage your scalp. And now I don’t feel so closely related to Cousin It. On Friday, I started working through the exercises in Linda Novick’s book The Painting Path: Embodying Spiritual Discovery through Yoga, Brush, and Color. I bought this book more than a year ago and CED seemed like the perfect reason to start using it. The first exercise was titled Remembering Your Artist Self. Here Novick leads the reader through a deep breathing exercise and meditation to remember playing in childhood followed by playing with oil pastels. 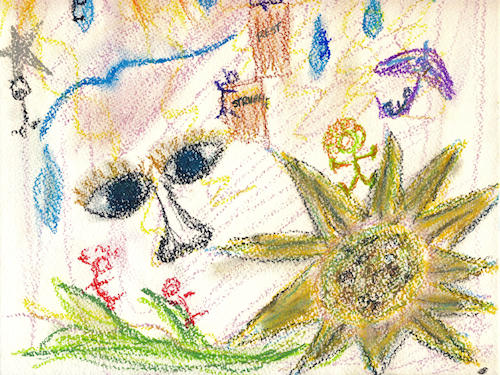 As a result of the meditation, I created the following pieces with the oil pastels. This first piece is a free form sketch on 11″x17″ paper (scanned in two sections.) 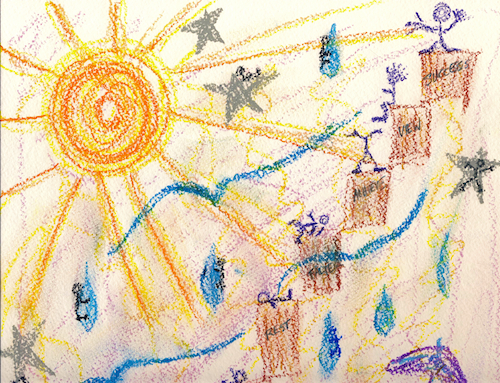 I started with scribbling the purple lines in the background and then added the various shapes and images. I didn’t know what to draw and wondered if I was doing this “right” following the meditation. The sunflower started out as a sun which was transformed into its current state. I’m not sure who all the little stick people are; gremlins or sprites? I love the staircase and the emotions expressed on each step. The words were added after the little people appeared so the words (struggle, rest, falter, achieve, view, success) match their emotions. Not sure either what prompted the pair of eyes. Perhaps, because of the meditation, the eyes represent me looking at my self; reflecting back on childhood and time spent drawing and painting. I think that is where the birds came from. I remember that I always liked drawing birds in flight on my papers. The interesting thing about this exercise is that it told me that somewhere along the way, we lose the free spirit ability to create art without wondering about the outcome. We lose the ability to just “be” with the art, to immerse, play and enjoy. I love the vibrancy of the oil pastels on colored paper; how the color shifts, pops and absorbs. 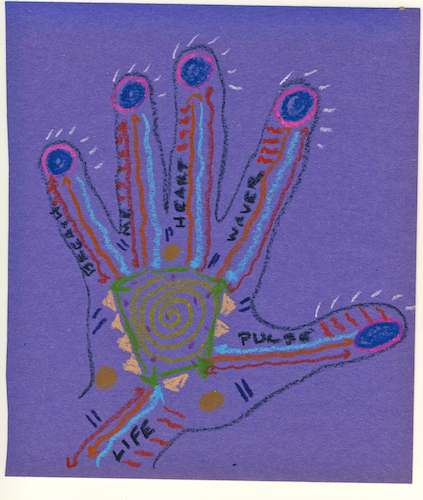 This hand represents me as an artist in this moment; feelings, life, emotions that flow out of the hand onto the paper or into the clay. The paper or clay flow back to the hand. It is a two-way street-hence the arrows in all directions. The artist hand gives life. There is a pulse, but sometimes you falter. This is me. My heart. I must remember to breathe. Categories: Amy's Art, art, Artists, Creativity, Favorite stuff, Inspiration, Mixed Media, Self-confidence | Tags: art, AVATAR, Body, Books, Creative Everyday Challenge, Creativity, health, Inspiration, Leah Piken Kolidas, Linda Novick, Mixed Media, painting, pastels, Spirit, Yoga | Permalink.